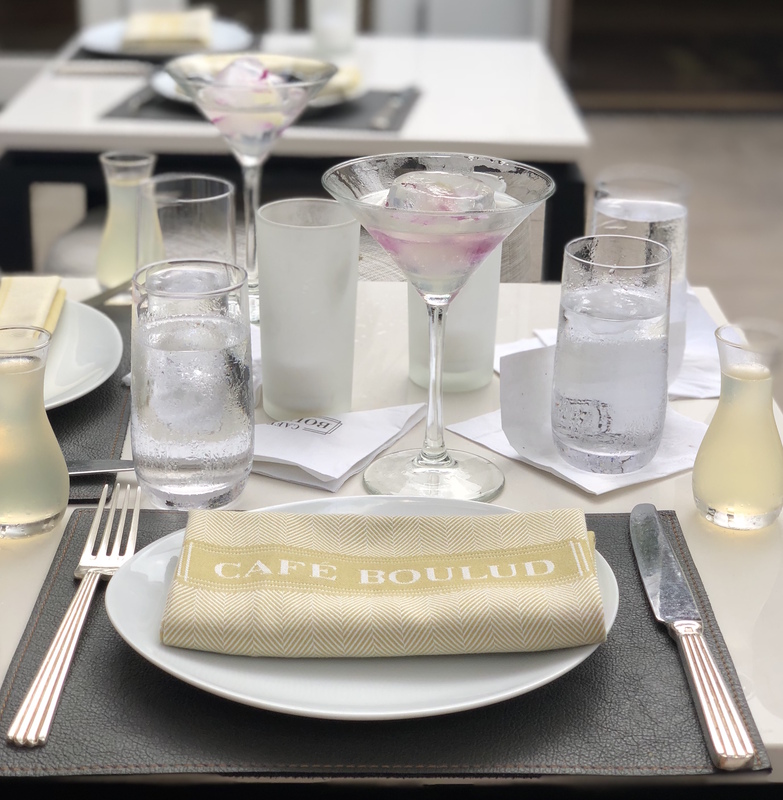 We joined the lovely ladies of Palm Beach Social Diary for happy hour at Cafe Boulud last week. The serene Daniel Boulud restaurant, located in the heart of The Brazilian Court Hotel, and its terrace sprawl onto the courtyard around the centerpiece garden fountain with lush greenery and shady umbrellas. A bar cart including white glove service is now available during happy hour, brunch and dinner providing guests with themed tableside cocktails. We were greeted by Vincent and an array of vodka, gin and accoutrement for a proper martini. For vodka lovers there were the single estate rye Belvedere Smogory Forest, with a savory caramel note, or Belvedere Lake, with a crisp fragrance. For gin drinkers there was the option of Tanqueray TEN or Nolet’s Silver. Spray bottles of essences were available to coat the cocktail and provide an aroma of fruit, citrus, floral or spice. A spritzer of vermouth, olives, blue cheese stuffed olives and citrus peels completed the setup which was reminiscent of the 1950’s and felt like the days of work lunches that ended with multiple martinis and a handshake deal. Vincent expertly prepared and poured our beverages while we perused the happy hour menu which features a Japanese flair. We settled on a spread of Chilled Soba Salad with a tobiko-chili dressing, Hamachi Sashimi with avocado and jalapeño, Grilled Avocado with a key lime ponzu sauce, Yakitori skewer with key west shrimp, shishito pepper, chicken meatball and BBQ Short Rib Dumplings served with a sweet sauce. Each dish set a tone of flavor and texture. There was a perfect blend of sweetness and spice throughout the menu and they all had a lightness that made them perfect for pre-dinner noshing. 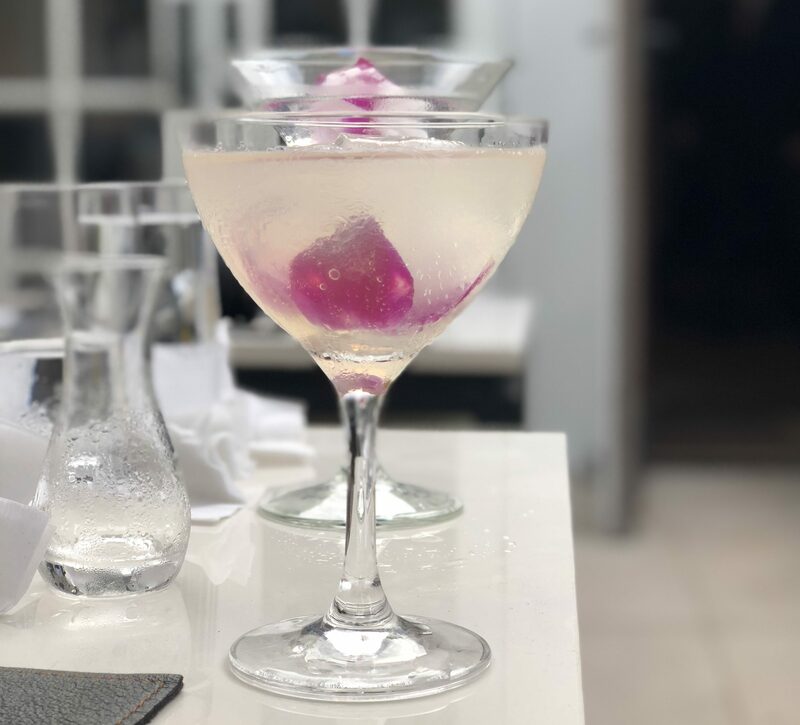 Off the happy hour cocktail menu we sampled the White Cosmopolitan, a beautiful blend of vodka, elderflower and white cranberry with an orchid ice sphere. This beverage is picture perfect and heavenly to drink. I absolutely recommend making a trip to experience the nostalgic and interactive bar trolley. 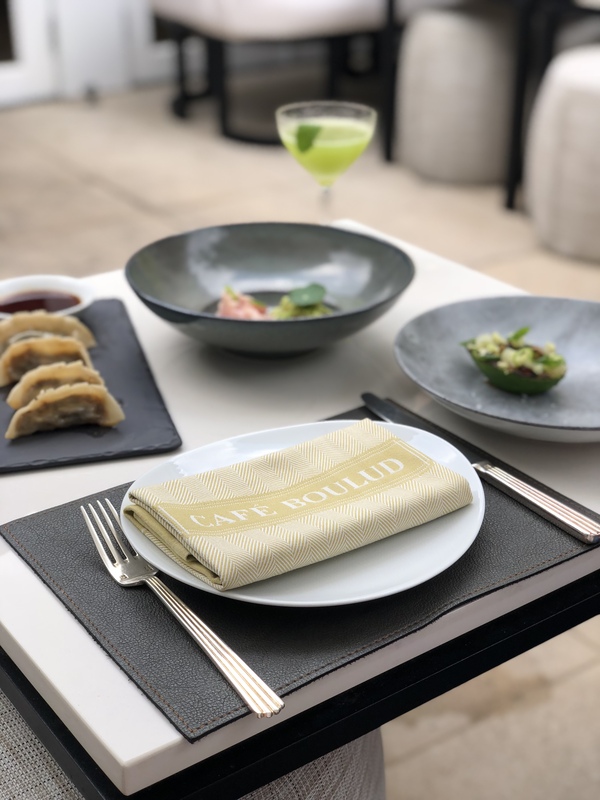 If you happen to be at Cafe Boulud for brunch, enjoy the Sparkling Libations offering of Mimosas, Bellinis, Kir Royales and other morning bubbles.